So many new places to eat are opening up these days. Not just in my neighborhood (in which there are a lot of great new places to explore and turn into hangouts…yay!) but all over. Our local dining scene has never been more vibrant. It is truly a diners market where one has a dizzying array of choices. There are those maverick independents whose delicious and creative offerings are the work of a brave soul armed with just his (or her!) passion and the desire to share it. Then there is the multitude of seeds being sowed by big gutsy restaurant groups – whose fruit seems to be sprouting like wildflowers one on top of the other, both local concepts and exciting foreign franchises. And every delicious drop in between. Often though, despite the glittering siren song of dazzling new dishes put together by fancy chefs and daring cooks, what we crave for is a little closer to home. Right at home actually, to be exact. The homely looking, the unsophisticated, the familiar tastes and comforting flavors, those dishes that look frumpy and plain and unready at all for an Instagram feed. Those dishes, homemade dishes, lovingly put together in our favorite pot, stirred through by our worn wooden spoon, scorched in parts and frayed in others, served directly in the cooking vessel, a tattered trivet slipped under it. The nights when we can all gather around the table, saying a grace, or having the little one say it even if we don’t understand half of what she carefully mutters. Slippers hanging on feet. Little C, feet off the chair please! My plate is chipped and I’m thinking, “When will we ever get another set?” We tuck in, ladle food out onto waiting plates. Contented sighs. Simple joys. 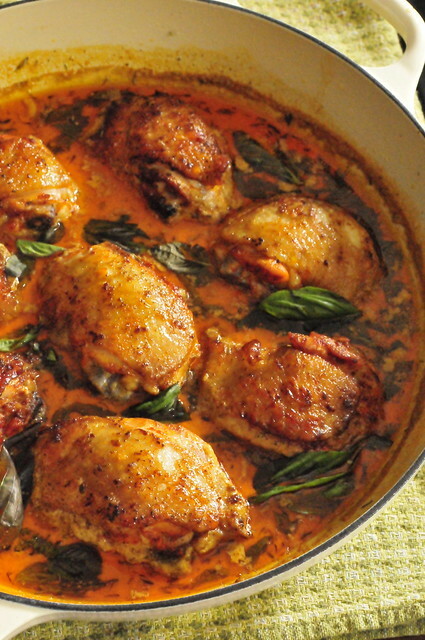 – Season the chicken thighs with paprika, salt, and pepper to taste. Set aside. – Place a large oven-proof skillet over medium high heat. Add the 2 tablespoons butter. When the butter is melted and bubbling, add the chicken pieces in one layer, skin-side down. Sear on both sides until golden brown, about 2-3 minutes per side. Set aside. – Drain excess fat from the pan then place the pan back on the heat with the remaining tablespoon of butter. Add the garlic and cook, stirring, until fragrant (about 1-2 minutes). Stir in broth, cream, Parmesan, lemon juice, and thyme. – Bring to a boil then reduce heat. Cook, stirring, until sauce has thickened slightly, about 3-5 minutes. Add the basil, stir until it is evenly distributed in the pan. Add back the chicken, tucking the pieces in around the basil. – Bake the chicken in a pre-heated 400F oven for about 25-30 minutes or until cooked through. Serve immediately. We cook some iteration of baked chicken regularly at our home. Chicken thighs or leg quarters are a mainstay in our freezer for just that reason. A tray of baked chicken is simple and frugal to prepare and can be dressed up or down with whatever you have right now in your pantry. It also pretty much cooks itself – tucked away in the oven while you go about doing other important things. Essential when you are a busy parent with two (oops, 3, the hubs counts too!) hungry mouths to feed. Equally essential when you are single and need meals that don’t feed a battalion – baked chicken is so easy to scale down! Here’s a single tip (from my own slightly swinging and single days): When buying a tray of chicken thighs ask the guy behind the counter to already divide it by two or three and repack it for you. He will do it if you ask nicely. It will only take a minute, does not change the price, and you will have small portions ready in the freezer for a solo meal (or a meal for two). I chanced upon this recipe from Damn Delicious and I knew I needed to add it to my baked chicken rotation. I was not mistaken. This produces such a lovely, flavorful pan sauce…and if you live in a country that has rice in almost every meal you know how important a pan sauce can be. I didn’t have any spinach as in the original recipe so I used basil instead and was rewarded with another layer of flavor in the sauce (not to mention the gorgeous fragrance that perfumes your home while this is baking). I still go out to eat and I don’t think I will ever give that up…I enjoy eating too much and I love to sample what these talented people have generously put out for us. And I don’t know if I will ever be able to manage lechon, chicharon, or sushi in my home kitchen…and we all know I can’t live without that. But there will always be a big chunk of my heart reserved for home-cooking (which is why I have a recipe blog and not a restaurant blog). Because no matter how far I ramble, when it comes to food, there is truly no place like home. Absolutely mouthwatering! A fantastic dish. Oh, yum! I can imagine how summery the flavors in this must be! Made this the other night and I must say, this is a winner! I agree that the basil gave it another dimension. I sprinkled with crumbled parmesan before serving for extra umami. wow this chicken looks really delicious. 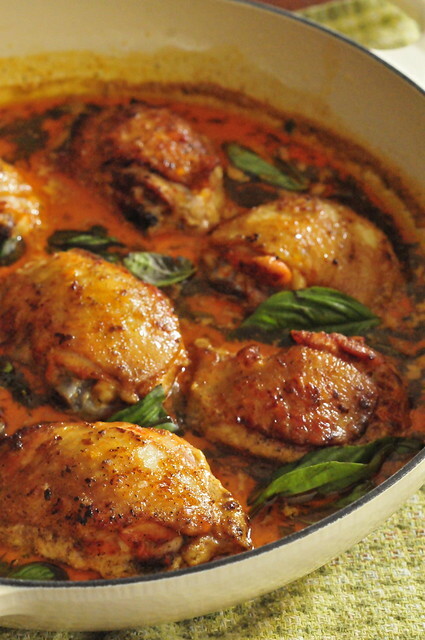 I love chicken and the next time I want to cook it I'm gonna follow this recipe only skipping the garlic cloves. I may take a picture of it and link it back here. THIS one look damn delicious! mmmm..can't wait to try this! I love this chicken! I had some homemade beef broth in the freezer so I used that instead of the chicken broth. I also used leg quarters because that’s what I had on hand! Came out delicious! It’s also pleasing to the eye! Wish I could post a pic! Do you cover the skillet when you bake the chicken in the oven?